Beautifully decorated 1024 sq. ft. 2 bedroom, 2 bathroom and 1 den and an underground parking space at Marinaside and Davie with spectacular marina and water views. High speed internet and cable, flat screen TV, Bose surround sound system. 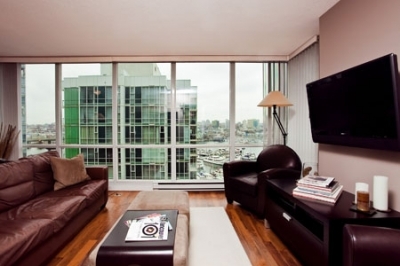 This lovely condo is in the trendy neighbourhood of Yaletown, full of hip restaurants and shops. Just steps to public transportation SkyTrain, buses and AquaBus. Direct access to the seawall, so you can walk along False Creek to the magnificent Stanley Park and English Bay areas 20 min, the Athletes Village 20 min, BC Place - where the opening and closing events are going to be held 10 min, Canada Hockey Place or General Motors Place 10 min, Robson Street 15 min, and drive to Cypress Mountain skiing and snowboarding venue 45 min. The kitchen is fully equipped and has granite countertops. The living/dining area has a soft leather furniture and a dining table that can accommodate up to 8 people. There is a sunny breakfast nook that seats up to 4. The master bedroom has a queen bed and TV and the master bathroom a large tub and separate glass shower. The second bedroom has a comfy pull down queen bed/desk unit with lots of storage and the second bathroom has a gleaming tub/shower. There are granite countertops throughout. Luxury bed linens and fluffy towels will be provided. Enjoy sitting on the covered large balcony that has a stainless steel gas barbeque and views to the marina. Or if you have to work you can do so in the cozy glassed office with computer, colour printer/fax/copier/scanner and shredder. A large common area includes a pool, sauna and hot tub gym with equipment, library, board and games room.